The Bobrick B-750 115-Volt AirCraft White Recessed Automatic Hand Dryer keeps your bathroom hygienic and free of paper towel waste. It features a no-touch, energy efficient electronic sensor that automatically turns on when it recognizes hands and turns off when they are removed. 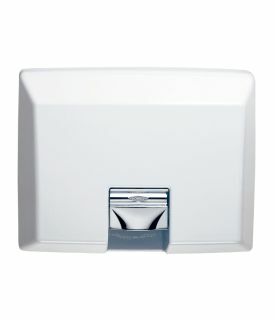 Perfect for businesses, schools, commercial buildings, restaurants, medical buildings or hotels, the Bobrick B-750 115-Volt AirCraft White Recessed Automatic Hand Dryer offers a warm blast of air to dry hands and keep your space free of germs. It has a clean, modern white enamel cast iron cover and a nozzle that adjusts to dry hands or faces. The patented Bobrick B-750 115-Volt AirCraft White Recessed Automatic Hand Dryer meets ADA Accessibility Guidelines and should be installed in a barrier-free, handicap accessible location.